Solidify your customer base, energize your sales force, attract a new buyer generation & generate revenue. What is social networking? Can furniture retailers use it to drive real and “virtual” traffic? If so, how do you implement it and what factors do you need to take into consideration before setting up a social networking area on your website? There are now over 200 social networking sites in daily use by millions of people around the world and thousands more niche social networks (also known as vertical social networks) made possible by services such as ning.com and KickApps.com. To give you some idea of the valuations of these sites, Facebook has been valued at $15 billion, Bebo at $850 million and LinkedIn at $1 Billion. If you doubt this, Bebo was sold recently for this amount and Facebook and LinkedIn raised capital at those valuations. The last valuation of MySpace was $850 million back in 2005 when it was acquired by News Corp.
• Manufacturers and suppliers of products you sell or related products such as window coverings for instance, will pay to advertise on your social networking site if the metrics show that you have a dedicated, core group of returning users. This can easily be tracked through Google Analytics. If you are not familiar with Analytics, see “Revenue Opportunities With Free Website Analytics” in the May/June 2008 issue of FURNITURE WORLD (posted to the marketing article archives on www.furninfo.com). • Advertisers will pay a premium to gain access to consumers who frequent your site if they have demographic profiles that match the advertiser’s marketing targets. • Loyal site users will pay for premium level of “connectedness” on your site. LinkedIn has a revenue model based on these “value-added” services. • Successful social network sites add value to organizations that provide them. In addition to boosting long term customer loyalty and sales for your organization, there is the possibility that someday a major media outlet may want to buy you out in order to gain access to your user base. Think HGTV, O at Home, etc. They are all searching for ways to more tightly align their advertising with “opted in” consumers (consumers who have chosen to receive content and be part of your network). I imagine that in the future, other revenue models will sprout up as social networking sites become even more popular. If you’re still not convinced, think of it from this point of view. Let’s assume that a manufacturer or distributor needs to market its products in your local or regional area. Their product, perhaps a non-furniture home improvement item, has the same target customer as you. If you have a robust SNS (social networking site) reaching 1500 engaged, active users who share information about their rooms, furniture, decorating tips, etc., you will certainly be a promising advertising outlet for this company. Here are two excellent examples of social networking websites. One is www.pbteen.com. When you go to pb teen (pottery barn teen) you will be able to see how (in the “Visit Stylehouse” section) teenagers can upload their room designs, vote on the best designs, register to win prizes, etc. Are the kids doing it? Go see for yourself. It is inspiring and exciting to see how engaged they are. This website can give ANY marketer/visual display person great insight into what kids like and find interesting. 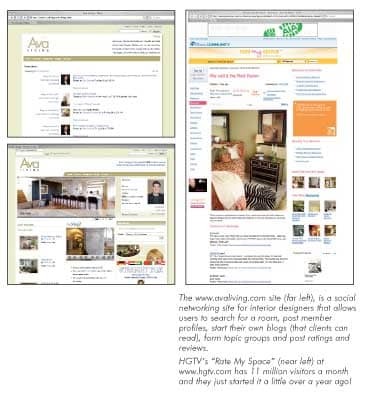 Another must-see site for home furnishings marketers is HGTV’s “Rate My Space.” If you haven’t seen it yet, go to www.hgtv.com and take a look. They get 11 million visitors a MONTH and it was launched a little over a year ago! So, if you doubt that consumers will take the time to upload their pictures, post comments, share tips and information, think again. So, what is the typical structure of a social network and how do you create one? • Ability to be “friends” with other users or get “introduced” to other users. successful free weight loss website www.sparkpeople.com. • Privacy controls so users control who sees what information about them. • Ability to upload albums of their favorite pictures, videos, podcasts or webcasts. • Ability to create a blog within the site. • Article sharing between users. • Ability to rate content, so that users control the flow of information to other users. Imagine the wonderful implications of this. Your customers will tell you what they think is valuable about the furniture they’ve seen in your store and about the shopping experience they’ve had at your location(s). No more guessing. And you will get a different perspective on your customers thoughts than you might get from online or written surveys. When consumers feel in control and understand that you are changing in response to their needs, you have the ability to create a truly engaged and loyal community that sees your store brand as a “lovemark.” This means they love you beyond what is reasonable, and work very hard to tell everyone they know how great you are! Think Mini Cooper, Harley Davidson, Apple and other expensive, consumer durables. Furniture retailers need to be in this game. • Ability to hold discussions in group forums and Instant Message with other users who are online at the same time. Imagine creating an online forum where you can invite (via email) everyone to come together for an online chat about your latest introduction of a designer collection or a seminar about universal design and what furniture best fits the needs of people with disabilities and/or the elderly. Then, imagine everyone talking about it afterwards in an online discussion thread. For an example of this in action, visit Oprah’s website at www.oprah.com. She is the queen of discussion forums and threads. Millions of women post to these discussions every day. There are other applications you might develop on your social networking site that would be especially valuable to your primarily female furniture shopping audience. One that comes to mind is an application that allows them to share favorite color combinations with other users so they can get an idea of what colors go together. Another possibility is to show small color tiles and allow users to arrange and share them. You could also create an application that allows users to “drag and drop” products into their own “mini-collections” and share them. This kind of information is immensely popular. These are great examples of how you can encourage existing consumers to teach future new consumers how to design their rooms. Maybe some of them will become salespeople for you? This type of information could be shared with your brick and mortar sales teams. Not only would it be highly motivating, it would also be instructive as it gets them thinking about the “what goes with what” design conundrum. With the rise of eclecticism and personalization of spaces, this application could become very valuable. How do you get started and what does it cost? 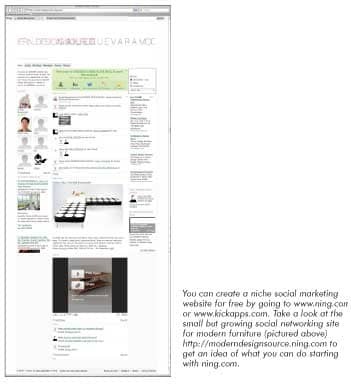 You can create a niche social marketing website for free by going to www.ning.com or www.kickapps.com. There are also many companies that can customize social networking platforms based on your particular needs. For good information on those suppliers, google the following: “custom social networking sites for retailers” (include the quotes so you get the exact order of the keywords you enter in your results. Without the quotes, you will get non- relevant responses). For a glimpse into what consumers think about social networking, let’s look at a survey conducted and compiled in February of 2008 by TNS, a global provider of consumer intelligence data. The study collected responses from 4,600 primary household shoppers in eight countries - the US, China, Canada, France, Germany, Japan, Spain and the United Kingdom. • 73 percent of UK consumers predict that group buying through social networking sites online will be prevalent in 2015, as consumers seek to increase their group buying power. • More than three quarters of consumers expect to be actively involved with the development of new products and brands by 2015. 78% of UK shoppers predict that the next generation of social networking sites will result in widespread collaboration between manufacturers and consumers. This has very important implications for retailers who MUST understand consumers’ need for engagement and develop a strategy that keeps them a part of the overall development process. • In China, a massive 95% of consumers questioned expect to be actively engaged in collaborative shopping communities within the next seven years. If you are a retailer contemplating an overseas presence , establishing a social networking platform for your stores now could be an excellent way to introduce your brand to an international audience. Social networking sites are here to stay and are a rapidly growing force with consumers. For the most part, with the exception of premium services users pay for, social networking sites are also free for consumers to use. They provide the ever increasing numbers of home based workers and stay-at-home moms and dads a way to still feel connected with other people with similar interests. Now people can find out what others are doing, thinking about purchasing, and buying. Now is the time to develop your own social networking tools to unlock vibrant, loyal, collaborative and transparent relationships with our consumers which can be monetized and capitalized upon. One last word: remember the tipping point. Social networking , according to the TNS survey, is only seven years away from mass adaptation by retailers. Be prepared to win.